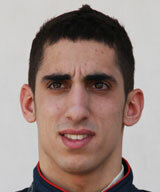 A product of the Red Bull young driver program, Sebastien Buemi was whistled through various categories before arriving in F1 in 2009. He drove for Toro Rosso for three years but after failing to set the world alight was given the boot in 2012, reverting to a previous role with the senior team. He was signed by Red Bull in 2006 and became their reserve driver in 2008 after finishing second in the F3 Euro Series in 2007. Despite having never won a championship, the 20-year-old impressed with his maturity and speed in testing. He then became Toro Rosso's first choice to replace Sebastian Vettel following the German's move up to Red Bull, despite finishing sixth in GP2 the previous year. He wasted no time in showing his potential, out qualifying team-mate Sebastien Bourdais in his debut race in Australia, and scoring points with a seventh-place finish. After an impressive start to his first season, picking up three points in his opening three races, he endured a mid-season slump, failing to finish in the points between the Chinese Grand Prix in April and the penultimate race of the season in Brazil. He out-scored and out-qualified his team-mate Jaime Alguersuari in 2010, but towards the end of the season struggled to match the Spaniard. It was the same story in 2011 and it was no surprise when he was axed at the end of the season, although that the team also dumped Alguersuari showed it had run out of patience with both of them. It was somewhat surprising when his career appeared to be salvaged by Red Bull itself as the world champions reinstated Buemi as test and reserve driver for the 2012 season. Buemi joined the Toro Rosso team and immediately outperformed his more experienced team-mate Sebastien Bourdais and his composure under pressure is impressive for one so young. However, he finished 2010 on a low complaining of the car's lack of straight-line speed. Finishing seventh in his debut race in Melbourne, ahead of Lewis Hamilton, Kimi Raikkonen and Mark Webber, among others. Crashing out of the Spanish Grand Prix on the first lap after being taken out by his then team-mate Bourdais. "You have to be realistic. You have to have self-confidence and put yourself in the best possible situation. But you have to keep your feet on the ground and not get depressed if the results don't come immediately." Buemi isn't the only racing talent in his family. His cousin, Natacha Gachnang, was the first woman to race in Formula Two in 2009.